Bafana Bafana head coach Stuart Baxter. Bafana Bafana head coach Stuart Baxter has announced the squad to face Nigeria in a crucial 2019 Africa Cup of Nations qualifier on Saturday, 17 November 2018 at FNB Stadium. The match kicks off at 15h00. Baxter has had to re-arrange his squad due to injuries to several of his key players - the latest being England-based Kamohelo Mokotjo. Other key players set to miss this fixture are Dean Furman, Bongani Zungu, Keagan Dolly, Sibusiso Vilakazi and Bradley Grobler, all out with long term injuries. "It has really been a tough task to select the team to face Nigeria without some of our regular players, but we have to soldier on. These injuries could not have come at the worst of times when we really need to collect all three points because we are well aware the importance of doing this," said Baxter. "The positive side, however, is that this gives us a chance to introduce other players into the squad, and these are players we have been monitoring, so it not like a knee-jerk reaction. This helps us to ensure that when we qualify for the tournament we have an even bigger pool of players to choose from. I am also confident that the players brought in will do a good job." Bafana Bafana and the Super Eagles clash at a time when the two have swapped positions at the top. Nigeria lead Group E with nine points, just one ahead of South Africa - who are yet to concede or lose a match in the qualifiers. "I must admit this makes the upcoming clash all the more interesting. Remember we beat them 2-0 in the first leg in their backyard, so they will come here trying to avenge that, on the other hand we want to regain the top spot which we relinquished with the draw away to Seychelles. 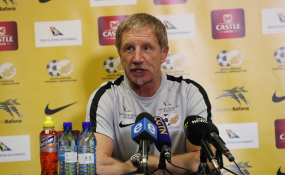 The good thing is that qualification is still in our hands," added Baxter. Bafana Bafana are expected to assemble for camp on Sunday, 11 November 2018 in Johannesburg. The Total Africa Cup of Nations tournament will be played from 7 - 30 June 2019. Cameroon are the defending champions and will host this Edition. The next AFCON qualifier for Bafana Bafana will be away to Libya in March 2019. Read the original article on SAFA. Copyright © 2018 South African Football Association. All rights reserved. Distributed by AllAfrica Global Media (allAfrica.com). To contact the copyright holder directly for corrections — or for permission to republish or make other authorized use of this material, click here.